Kalahari animals are creatures which are wonderfully adapted and have such remarkable skills that we as human beings can only, whenever we have a chance, use all our senses to learn from and enjoy them "on stage". The Kalahari serves as a theater and is able to entertain each and every visitor that is open to the beauty and perfectly created region with its wonderful animals. In an audience watching a show, every person appreciates a different part, effect, line, act or setting of the whole. The same thing happens to our visitors (see what they had to say) when they experience the wildlife of the Kalahari. Each of you that visits the Kalahari desert in Namibia, if it is on a photographic safari or an African hunting safari, will be affected and inspired by the Kalahari animals. You will go home with a trophy - if it is in the form of a picture, a new friendship, a perception and new understanding of nature, anewed awareness of the Creator or in the form of special horns as a token of your encounter with the Kalahari. About the Kalahari animals: As much drama can be find on the low end of the size scale as on the high end of the size scale. The rodents, lizards, insects and birds all play their own parts in the show and are not to be forgotten. Warm summer nights in the Kalahari are most of the time filled with the sounds of the nocturnal common barking gecko (Ptenopus garrulus), or in Afrikaans grond geitjie. The calls of these little reptiles signal sunset and for all living in the Kalahari, this means also that another hot day is ending and that the coolness of the night has arrived. This barking gecko's call is a chain of clicks ("ceek-ceek-ceek"). These sounds come from the elaborate burrow systems in the red sand, which have concealed escape holes. The males call on most summer nights to attract mates. Although these little "music-boxes" emerge only after sunset, they are effectively camouflaged in the sands of this semi-desert area. You will be lucky to ever see them, but...you will definitely HEAR them! This entertaining sound is part of growing up, living in and visiting the Kalahari. A great personality among the Kalahari animals of this region, is the meerkat or suricat (watch their video) (Suricata suricatta). They are sociable and good-natured and a lot of fun to watch performing their special little acts. These are the "Meerkat Manor" stars! The first amazing thing about them is their living as close-knit-family groups. They have unusual altruistic habits. Each little band has a dominant female (that breeds) and the other female members of the band take turns looking after the offspring in order that the mother can venture out with the group to look for food. This is to ensure her ample milk supplies. They also have guards in every group that have the welfare of the family at heart and will find a high place to have better view for enemies. When enemies approach, the whole band will advance in a tight bunch and the dominant male will lead the attack. A delightful sight is to see these funny little Kalahari animals bond as families by frequent grooming, playing and huddling together. Their playfulness, care and consideration as a family are inspiring. They serve as a charming and highly pleasing contribution to the sight-sense of any onlooker. And there are so many more small Kalahari animals to discover: jackals, bat-eared foxes, the common pangolin (see a video of this scarce mammal), porcupines, honey badgers, snakes, etc. You should come and see this play in action! Get yourself this spectacular DVD on the Honey Badgers of the Kalahari! To the most famous and well-known "stars"
How can I other than start this section with the most typical Kalahari animal, the Gemsbok/Oryx (Oryx gazella). This manificent antelope is so perfectly created for this specific part of Africa and its climate that you will be astounded when discovering these facts. Let me mention some of this animal's primary instincts, traits and qualities that made them so famous on the Kalahari-stage. To deal efficiently with the arid- and harshness of the region combined with the climate-extremes, these Kalahari animals plan their daily activities, like when to graze and when to stay inactive, accordingly. They also have super-efficient built-in radiator-systems in their brains that ensure surviving the hot days of summer. Other attributes are specialized outer coverings, body-temperature-regulators and psychological remedies for the days when air temperature hover around 40°C (104°F). All these characteristics help the gemsbok to make it a superbly adapted mammal of the Kalahari. Read a true story of a tame kalahari gemsbok! Another giant Kalahari animal, whose splendors are majestically played out in this region, is those of the eland (Taurotragus oryx). 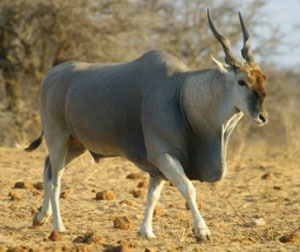 It is the largest of the African antelope. Males have a shoulder height of 1.7m (70") and can weight up to 900kg (1985lb). The females are nearly as big and heavy. They live in mixed herds and groom one another by licking the head, neck and rump of one another. Separate dominance hierarchies exist among males and females. Since these animals are so big and bulky, it is quite a spectacular show to watch when the dominant bull displays his status among the group. He bellows, shakes the head, jabs with his horns at adversaries and stays close to his female. The courting, however, is just as theatrical. The bull charms his cow by rubbing her flanks with his head, licking her and resting his chin on her back. He will also paws and horns the ground as part of the show. The plains game (see our available species and pricelist) of this region in Namibia are all beautiful to watch, to learn from and to take home a trophy of. Read more about the Greater Kudu, Kalahari Springbok, Kalahari Gemsbok / Oryx and Steenbok (watch our own YouTube Video of these little antelope). All of the most dangerous (the leopard), the speediest (the cheetah), the biggest (the lion) and the strongest (pound by pound, the caracal) of cats can be found in the Kalahari of Namibia. The six Southern African species of large carnivores are lions, leopards, cheetahs, spotted and brown hyenas and wild dogs. The hunting techniques each of these cats use, differ. The leopard uses a classically feline style during the day and will stalk to within 10 meters or waits in ambush for his prey. Lions are most active at night and the females usually hunt together by stalking in line abreast of their prey. Caracals are strictly solitary and also hunt like that. They capture their prey by stalking, chasing and pouncing. The cheetah is well known for its stalking technique followed by an explosive acceleration to 120 km/h (75mph) during hunting. These cats are very intriguing and if you are lucky, you may have the privilege to come across any of them. Their beauty, skills and customs will spark your interest in the animal kingdom of this part of Southern Africa. They indeed are the cherry-on-the-Africa-cake. Click here for real entertaining videos of these African cats!